The original Game Boy was launched way back in 1989 but despite its advanced age it's still getting new software - albeit of the unofficial variety. OrionSoft has just released Escape 2042: The Truth Defenders for the monochrome console, a "futuristic fast-paced platformer game" which takes place in three different environments and features 2 mini-games. The objective is to avoid the unwanted attention of security cameras, collect grenades to deal with enemies and hack computers to unlock doors and find the exit. As well as hitting the Game Boy on a physical cartridge, Escape 2042 is also coming to the Sega Mega Drive / Genesis and Sega Dreamcast. It's also available on Steam. I love the idea of new physical games for old consoles. 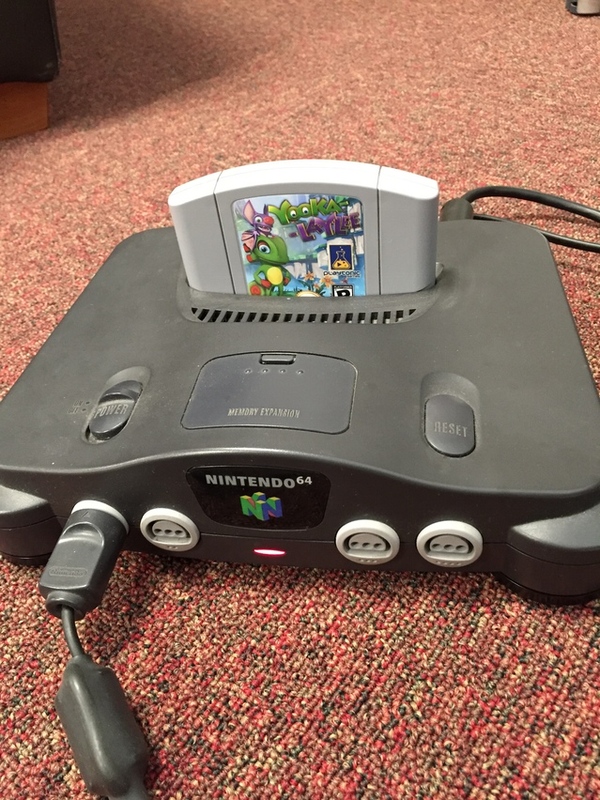 In fact, can you imagine if yooka laylee was a physical n64 game? @Menchi187 If only it was an actual working version of the game! @Aurumonado I remember when the kickstarter goal had "physical N64 box and cart" and everyone lost their minds thinking it was gonna be working. Interesting. Is the game any good because I'd be tempted to get that? And to think, Wii U owners thought THEY had a long drought to contend with! I assume it'll play on the GCN Gameboy adapter? I'm going to pick this up. You just don't see this too often! Retro gamers rejoice! Wow, the movement looks quite slick. My GameBoy nostalgia is intense. People who love video games love releases like this. I don't know, if I get the GameBoy version I'd have portability, but I might just have to get the Genesis version for the cutting edge graphics. I dream of a future where I no longer have to make these kinds of decisions and a console will exist with Genesis level graphics and still be portable! The game play seem smooth. @NEStalgia Yeah, that would be awesome and one that no longer needs those bulky battery packs or a bag full of AA batteries. @NEStalgia well you could always get a nomad. lol. @NEStalgia Funny thing, I love my game gear. Granted I spent a bunch of money replacing the screen, and it's not really portable but still it does it's job. @Yorumi Gamegear was ahead of its time haha. It devoured batteries with no remorse. Think I still have mine. @Yorumi Yeah, mine needs a screen replacement too The white-line of death claimed it many years ago. And it's impossible to run without the AC adapter! Still a proudly owned item next to my DMG GB and VB though! Gotta pop that in my Super GameBoy! A homage to Impossible Mission I & II. @NEStalgia I got a modern screen so it looks beautiful, it's not all dark and hard to see anymore. Master system games look great on it too. Problem was it costs way too much. I suppose it was ultimately worth it though as I wouldn't be able to play a gamegear with it's normal screen. @Yorumi Hmm, I don't remember the original being so dark and hard to see.....though it's been a good many years since I've actually seen anything but the mentioned white line I still turn it on from time to time just to hear it start up though! I left the Sonic cartridge in all those years ago so I still get the "Seega" and ring sound on startup. It's good fun. How much does that kind of replacement cost? (Not that I had many games for it....my GB definitely won my handheld use. I THOUGHT I wanted a GameGear until I realized it looked like a brick, weighed the same, and needed the AC cord! that's the screen I got. I forgot what they charged me, and you might have to google it to find someone dong the replacement. But I think it was around $60 and then I had them do it for me which meant I had to ship it to germany(international for me) and that ended up being around another $80 or so. It was a hard pill to swallow but every time I boot up that GG and see that beautiful screen I know why I did it. I use it for master system games as well as I mentioned, so I get a good bit of use out of it. I just wish it was more portable, or that there was a good rechargeable battery for it. I have some eneloop AA batteries for my GBA, but the GG only gets about 3 hours on a full charge of 6 of those so it's not really worth it to me so I just play it plugged in all the time. What I want more than anything would be a way to power the system via a usb cable cause I have a power bank, just no way to get that power to the GG. If your not from Europe and want this game, The Bit Station in the US has announced they will be the official dealer for NA. I talked to the owner and he said they are waiting on the shipment to arrive and the game should be available for purchase by the beginning of May. Here's a link to their website: http://thebitstationgames.com/. They also have a lot of other really cool new games for retro consoles. This is the hipster gamer's version of vinyl. I guess it's just better this way? @therealdude kind of. For retro games they're often just not as good on a pc, sitting at a desk, vs on real hardware. On top of that for retro gamers, almost all emulators introduce some issues. Not quite perfect graphical or sound emulation, input delay, in general things that just arn't exactly right. So it's great to play them on actual hardware. It looks cool. Does anyone know how they are producing the cartridges? Are they cannibalizing old GB cartridges? @drich255 Nope, these are made from all new parts. The reason I know this is because The Bit Station won't stock anything that uses cannibalized parts. @Underoath_048 Nice! I am not trying to be a troll, but it seems like Nintendo would have a patent on the cartridge shell. I am sure they got things squared away and wish them the best of luck! @drich255 Retro Indie Developers are really meticulous about things like legality, especially if a game is designed for commercial sale. That's why they program these from the ground up, without relying on original dev kits and techniques. It's quite impressive. Also, to my knowledge Nintendo doesn't have any trademarks for consoles older than the N64. That's why you don't see any new legal games or clone console support for anything past the SNES. @drich255 also keep in mind patents only last about 15 years. Essentially anything that was patented before 2002 isn't covered anymore. Though I don't think cart design is patentable anyway. I want it for all 3 plats. This probably confirms that my collecting habit is back in the ugliest way, after about 8 yrs of semi normal existence and interests haha. Gonna have to start hiding all these toys...again (embarrassed). But ya it's really nice to see they released this on these particular 3 systems. Added to my list. Great game but its a shame they couldnt be bothered to do more with the manual, they are using cheap universal game cases and the manual is a piece of paper. i think its brilliant that this is a real thing and i will buy just the carts of both, but if you are going to go to all the trouble of making a new game for an old system then you should make it authentic. @itslukec you know that rechargeable batteries are a thing, right? @Yorumi That's pretty cool. It's more than a screen replacement, it's a whole video conversion upgrade with built in scaling etc. I certainly never had enough games to warrant it, so no need to go that route, I just need an OEM screen that's not broken But that's the coolest "modplacement" I could think of for that little machine! @JacquesLecornu Yes Jacque....I do. haha. I just like to stick it to the environment. When the Game Gear has eaten another 16 batteries, I toss them out of my car window onto the road. @NEStalgia I've kind of decided retro gaming is the thing I spend a bit of money on so I like good mods. My gba is modded with a 101 screen in an original wide gba. I eventually want to get a professional broadcast monitor and RGB mod my consoles for best picture and such. It's nice bringing some modern technology to old games. @Yorumi That's really cool! I don't think I could ever commit so much to retro-only gaming. I love the old stuff, but some of the design structures back then drive me crazy...I'm too impatient these days, where when I was a kid I didn't mind slamming my head against the wall endlessly, now if I have to do the same thing more than twice it's like "forget it, I'm moving on to a new game" But it would be darned cool to see some of the old games with a setup like that. I haven't tried to power on the old consoles in ages. I know the NES toaster slot was getting iffy back in the day (darn you, Game Genie, by Galoob! Still have the box though!